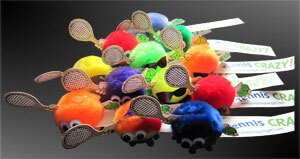 These great little fluffy tennis bugs come in various colours, either with bug eyes or shades. They are ideal for coaches to give out on courses, or at the end of term, or for add-on gifts for a child – though please note that they are not toys and are not suitable for children under 5 years. There is a different bug in each of our Party Bags. Set of 24 Mixed Bugs 2 of each bug.